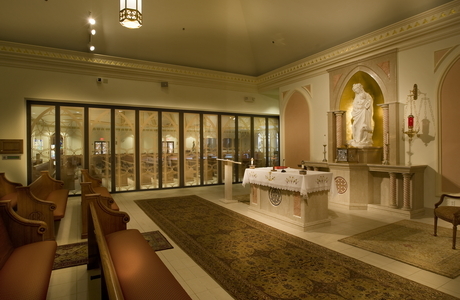 St. Anthony of Padua Parish occupies a site in Ambler, Pennsylvania, 16 miles north of Philadelphia. The church was designed with two separate but adjoining worship spaces. 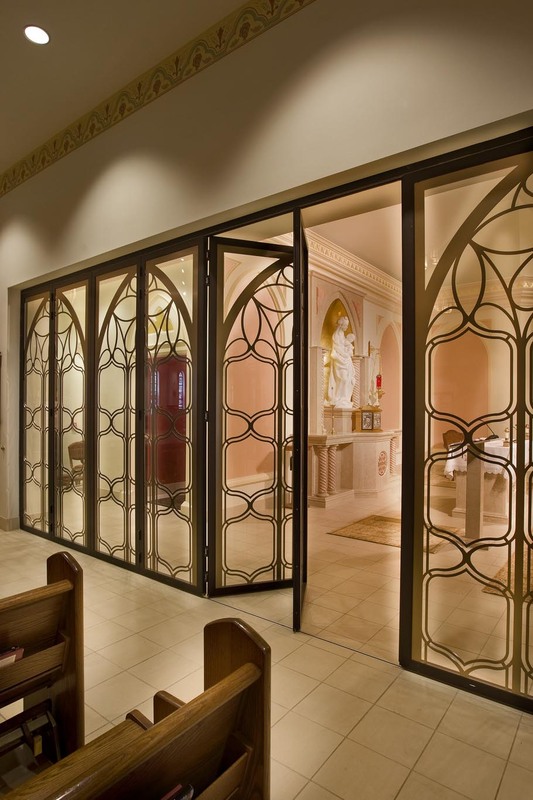 To meet project goals requiring both visibility and noise attenuation, the design team installed an exquisitely integrated NanaWall installation to separate the chapel and nave. The needs were varied, but all could benefit from the NanaWall approach. “Families coming to services would often need a place to keep and attend small children, but without feeling disconnected from the rest of the congregation,” says Knabb. “Then for holiday services, when there is the largest attendance, the church would need to accommodate a larger segment of the parish." Both Knabb and the general contractor, Tim Clearkin of James J. Clearkin Construction, recommended the SL45 Aluminum Framed System with paired panels to the client. 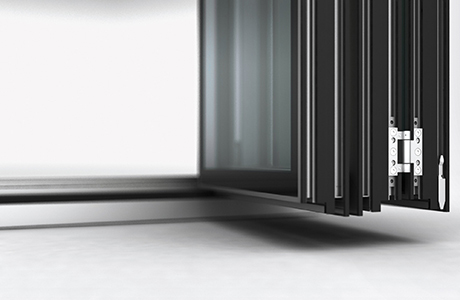 The system solved many problems in separating or joining the spaces, according to Knabb. “The NanaWall system provided an ideal solution,” says the architect. 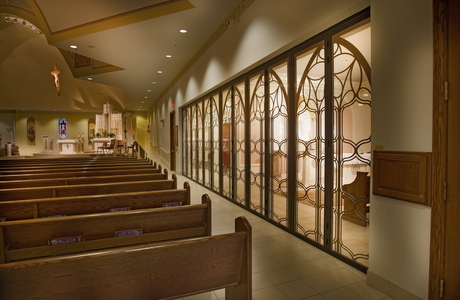 “The noise-attenuating, transparent division between the smaller side chapel and the main worship space created a place where families could care for children while still participating in worship, but without disturbing or interrupting the service.” For larger masses, he adds, the glass wall opens fully – “practically disappearing,” in Knabb’s words – allowing the side chapel to serve as additional seating. Knabb had experience with projects using NanaWall, and was aware of the potential for enhancing the design. "I've used NanaWall on a number of projects,” he says. “Their systems function exceptionally well and are, like the one at St. Anthony, heavy-duty yet very attractive and easy to operate." The NanaWall’s system provides privacy between the nave and chapel, yet connects each in modernized medieval imagery. Each of the twelve panels, spanning 30 feet, is painted with half a lancet. The design team specified a black anodized aluminum frame, which emphasizes the golden oak finishes found in both areas, and the curvilinear design of the stained glass effect. Of course, the aesthetic elements are secondary to one of NanaWall’s primary purpose: to join the two spaces during holiday or celebration services. The panels provide excellent sound attenuation. 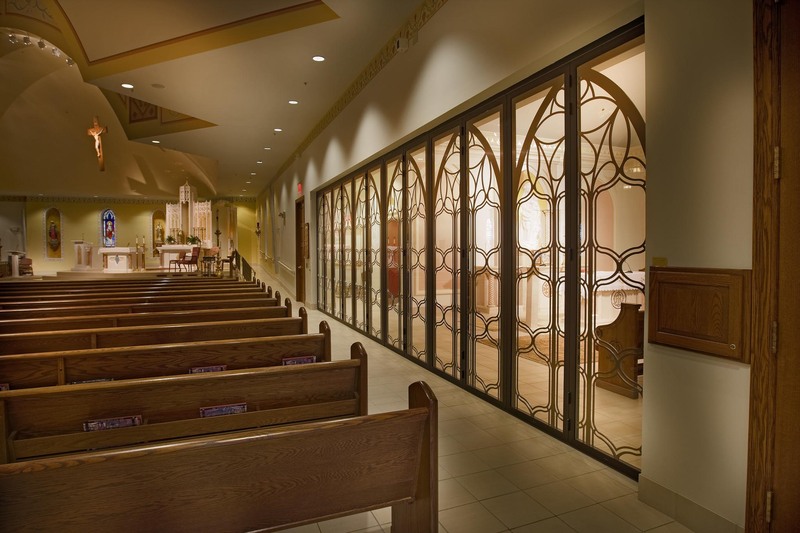 The monumental glass panel system combines or separates multi-function spaces in a transparent way, and has the ability to be modified to match the design needs of the space, making St. Anthony's a flexible, as well as attractive, worship space. 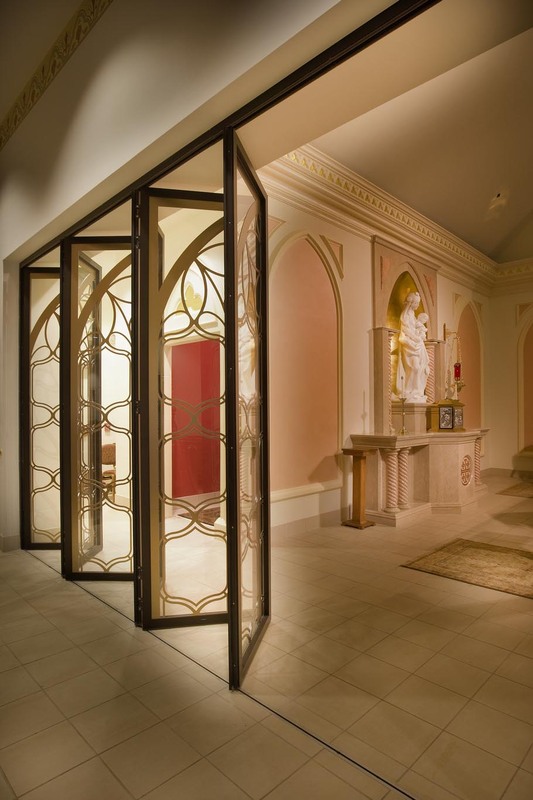 The church at St. Anthony of Padua received the “Design of Merit” award from the Society of American Registered Architects at the Pennsylvania Council Professional Design Awards ceremony on September 7, 2006. "Our NanaWall system was installed in the late 90's, but it is by far the best performing and least problematic of all the door systems here at the Skirball Cultural Center."